If bobsledding doesn’t work out for Hun School alum Jamie Greubel-Poser, there’s always a place in Vegas handicapping football games. 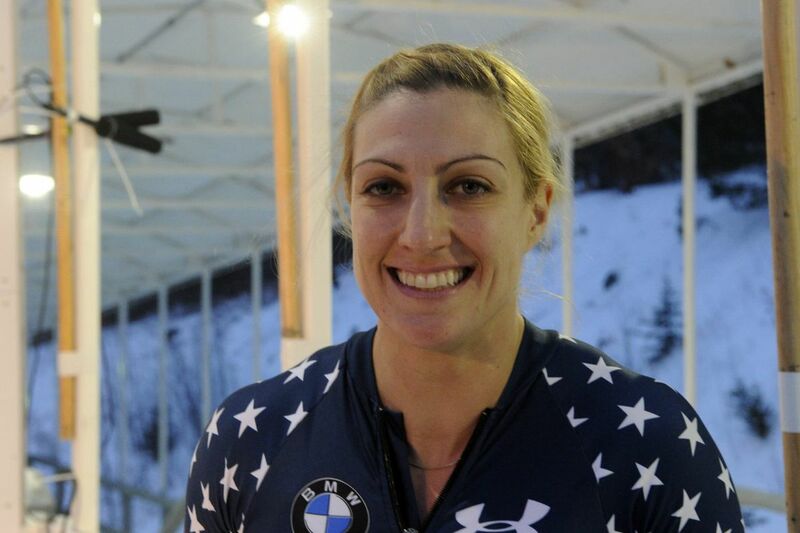 In the eyes of Philadelphians anyway, if Jamie Greubel-Poser captures another Olympic bobsled medal this week in Pyeongchang, it would be only the second most impressive feat she's managed in the last 10 months. Back in April, a few weeks after the Eagles signed Nick Foles as a backup QB and long before the 2017 NFL season, the Newtown Olympian was asked by NBC to predict the participants in Super Bowl LII. "Eagles and the Patriots," Greubel-Poser says in a moment preserved on video. "Who wins?" asks an off-camera voice. "Eagles," said the bobsledder, "43-29." Beyond stating the obvious – "We've got to be really fast" — Greubel-Poser hasn't attempted to forecast the 2018 Winter Olympics two-women bobsled competition, the first two heats of which will be run Tuesday. But given the track record the 34-year-old pilot and brakeman Aja Evans have compiled on the 1,376-meter Alpensia Olympic Sliding Center course, a spot somewhere on the medals stand is a real possibility. Earlier this week, Greubel-Poser and Evans posted the third-fastest training run (51:12 seconds). And in March, the pair won a World Cup event at the same South Korean track. The comfort level that success created is essential in a sport where the sled she's driving could hit speeds of up to 95 mph on its descent. "The more experience you have, the better you know the layout of the track and what to anticipate – each little shift, bump, pressure point," she said last month. "You learn how to handle everything. In a sport measured to the hundredth of a second, there is no room for hesitation." Four years ago at Sochi, Greubel-Poser and Evans captured a bronze medal, finishing behind the gold medal-winning Canadians and American teammates Elana Myers and Lauryn Williams. It was a noteworthy Olympic debut for the 5-foot-9, 170-pound Bucks Countian who was a track star at Cornell. A natural athlete who in addition to track had been an equestrian and a field-hockey and basketball player, she was looking for another sport when she graduated from Cornell in 2007 with a degree in animal science. A track teammate suggested that given her competitive nature and physical strength, she might be well-suited to bobsled. She began as a brakeman, failed to qualify for the 2010 Games, then made the switch to pilot. All the while, she grew stronger. "Once I started, and my body finally got used to it," she told the Inquirer in 2014, "I started considering the real opportunity I had in front of me. This was an Olympic sport, and you didn't have to be competing in it your whole life to have a chance. Until then, the Olympics had always seemed like a separate entity. Olympic athletes were like movie stars to me. I never made the connection that it could be me." Her first trip down a mountain, she recalled, "felt like a car accident. Or like being in a tin can that was kicked off a cliff. It was horrible. Really shocking. … But you have to be resilient. You learn by doing it. You learn by your mistakes." Long and lithe as a track star, Greubel-Poser's transition to the winter sport has necessitated new muscles and a new body type. "We're trying to be big and strong," she said. "We do a lot of heavy lifting. I hadn't done much lifting in college and it was intimidating to completely change from what you know. I had to buy all new clothes. I look back at pictures and my perspective has totally changed. I can't believe how small I was." And since Sochi, she's added something else – a husband. In the summer of 2014, she married German bobsledder Christian Poser, whose two-man sled finished fourth Monday in Pyeongchang. Their parallel careers have to this point made for an unusual marriage. Last spring and summer, for example, they went five months without seeing each other. "It works because we get it," she said. "I don't have to justify or explain why I'm doing things all those times I need to put my goal ahead of our relationship. It's not something that works for everyone." Greubel-Poser's mother is a Children's Hospital neonatologist, her father the owner of a landscape company. A Hun School graduate, she has three siblings, including a 17-year-old sister, Elizabeth, who was adopted from South Korea. Elizabeth and Greubel-Poser's father have been touring South Korea but arrived in Pyeongchang in time for the men's and women's bobsled competition. That connection between the site of these 2018 Games and her sister's native country has added another layer of meaning to Greubel-Poser's Olympic quest. "I wanted to go to Sochi because I wanted to be the best in the world at my sport," she told USA Today. "I still do, but this has a deeper meaning for me now. "Just kind of walking around and being like, `My sister could be here. She could be any one of these people that I'm meeting.' It's very emotional." Almost as emotional as she was on Feb. 4 when the Eagles won Super Bowl LII, their 41-33 victory nearly matching's Greubel-Poser's prophesy. "What did I say, @NBCOlympics!" she tweeted that night. "Fly, Eagles, fly!"